Some thoughts on pressing philosophy and a couple of drills to work on your presses. 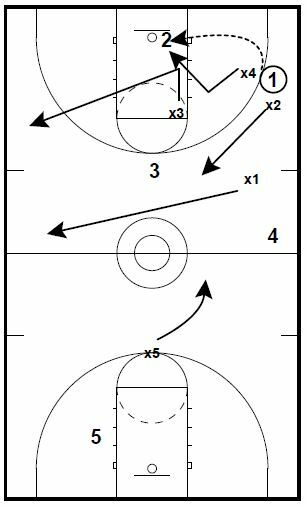 These drills are from Trey Watts’ Meet the Press Playbook which is paired with the the Princeton Hybrid Offense Playbook this week’s eBook bundle. If you have any questions about the Playbooks, please feel free to email me or call/text me at 765-366-9673. We must be able to exert pressure on the ball. It is vital that the man pressuring the ball be able to pressure without fouling. Fouling will negate all the work that the team is putting into our pressure defense. We cannot let a ball handler look over our press and pick apart the gaps with passing. He must be forced to dribble. We must always have a sprint mentality. Regardless of what previously happened. We must sprint to rotate. We must sprint to recover. We must sprint out of traps. We must rotate without hesitation. We can’t second guess whether we should go or where we should go. Repetition has built confidence in our rotations. 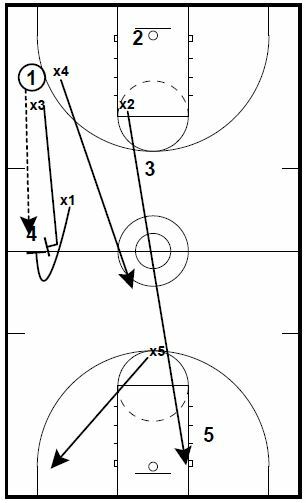 Rotating on ball reversal is critical. We must become very good at backtipping dribblers. It is very important that they sprint thru the backtip. They chase the ball handler until he either passes or picks up the ball. We our players to get good at anticipating what the offense will do. Will they try to beat us off the bounce? Where do they like to pass the ball? We need to learn to read the passers eyes and anticipate where he is going with the ball. Each is important that each player know what they are capable of doing on the court, coverage wise. This is when the ball is headed up the sideline and our backside defenders are sprinting back down the middle of the floor. Usually the offense is looking to make a cross court pass for a basket, we ANTICIPATE this pass and try to steal it in the BACKWASH. 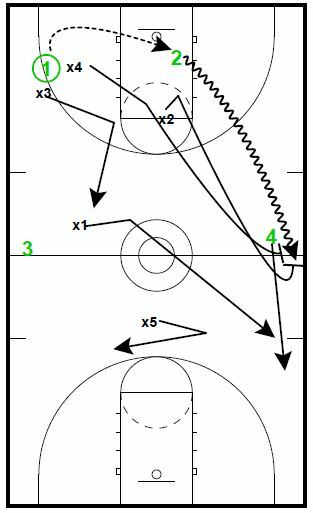 This drill is designed to work on help side wing play. One of the most important team attributes of great pressing teams is PATIENCE. Traps and high tempo are not always in order. The drill begins with the ball in 1st trap situation with X2 and X4. The ball is then reversed to the middle of the floor and dribble hard at the weak side wing or held for a two count as some teams like to do against pressure. In either case, the wing must exercise patience in order to allow teammates to recover to proper spots. BE READY TO COVER DIAGONAL PASS. X1 MUST CROSS FLOOR QUICKLY TO BALL SIDE. X5 MUST MOVE TO WEAK SIDE NORMALLY. *** AGAINST PATIENT, METHODICAL OPPONENTS WE ARE LOOKING FOR 2ND TRAP OPPORTUNITIES. Here we want to work on how we react when someone makes a pass out of trap. We will start with the players in a trap in the first trap area. We start by the coach dictating where they will pass the ball for their escape. We want to work on the reveral pass first. Once the 1st pass is completed we play it out live, down and back. Here we have the offense complete a pass up the sideline. We consider this to be a vertical pass. We will sprint from behind and trap. X2 SPRINTS to cover backside. Once the pass is completed it is live, down and back.